A history of TB drugs often starts with the development of streptomycin. Following on from this isoniazid will be mentioned, but very often para-amino salicylic (PAS) is left out completely. Is this an accurate account of what happened? Also a history of TB drugs needs to include not only when drugs were developed, but also the disagreements that occurred about who should take the credit for the development of a particular drug. Was it Waksman or Lehmann who developed the first drug? Who should have received the Nobel prize? Who should have received the royalties? Before the development of TB drugs, surgery was used for TB treatment. A starting point for a history of TB drugs is that the second world war had started, and a biochemist Frederick Bernheim was working on his own at Duke University in North Carolina in the United States He believed that the second world war would result in a massive increase in the suffering and deaths from Tuberculosis. He also knew that there was no effective TB treatment but what could he do about it? He carried out a number of experiments and found that the simple asprin played a vital role in the life cycle of the tuberculosis germ. Suddenly Lehmann experienced a moment of understanding that would change his life. What if the humble asprin molecule was the key to the greatest of medical mysteries, he asked himself? What if he could take this key and open the door to the cure for tuberculosis? If salicylic acid stimulated the oxygen uptake of the bacteria, then could another form of salicylic acid inhibit the metabolism of Mycobacterium tuberculosis and stop it reproducing? However Lehmann was busy with an anticoagulant drug he was developing, and it was to be 1943 before he returned to the subject of Tuberculosis and asprin. www.ncbi.nlm.nih.gov PAS turned out to be the most active of the many molecules that were subsequently tested. PAS did however turn out to be very difficult to synthesize. It was not until December 1943 that Ferrosan sent 13 grams of the compound to Lehmann. On New Year’s eve Lehmann wrote to Ferrosan announcing that PAS substantially inhibited the growth of M. tuberculosis. www.ncbi.nlm.nih.gov There was then a small clinical trial involving 20 patients and in January 1946 Lehmann reported that the majority had responded well with a drop in temperature, weight gain and general improvement. The development of PAS was overall beset with delays and difficulties. There was no sense of urgency and there was widespread scepticism. Few people outside of Sweden knew about PAS. Meanwhile the development of Streptomycin was also progressing but at a much faster rate. Selman Waksman was a soil microbiologist who in 1939 was working at the Department of Microbiology at New Jersey Agricultural Experiment Station, at Rutgers University, New Brunswick. He studied the effect of soil microbes on each other. Over the previous 25 years Waksman, his assistants and some graduate students, had obtained and published information not only about fungi, but also about the methods and techniques they used to obtain the information. Along with studying fungi he also studied the actinomycetes. Actinomycetes are a group of microbes which can be considered as intermediary between bacteria and fungi. 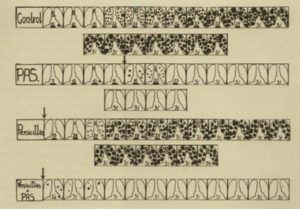 Waksman had found in his previous studies of the microbiological affect of the soil that actinomycetes could exert a very peculiar effect on certain soil bacteria which resulted in their growth being inhibited. So he then turned his attention from studying the soil to specifically looking at the sensitivity of the TB organism to various actinomycetes. In 1939 he began a systematic search for microbes found in the soil that had the capacity to prevent the growth of disease producing bacteria. Various preliminary studies of the production of antibiotics by actinomycetes resulted in the isolation of actinomycin in 1940 but it was extremely toxic.5Waksman, S, “The Conquest of Tuberculosis”, Robert Hale Ltd, 1964 This was followed two years later by streptothricin which was also found to have significant toxicity. So the search went on and in September 1943 another compound named streptomycin was found which was less toxic to animals but which otherwise had some similar properties. The first public announcement of the isolation of the antibiotic was made in a paper in January 1944 6Schatz, A., Bugie, E., and Waksman, S. A. “Streptomycin, a Substance Exhibiting Antibiotic Activity against Gram-Positive and Gram-Negative Bacteria”, Proc. Soc. Exper. Biol. Med., 55:66-69. Before the end of the year its activity against the TB organism had been demonstrated. In less than two years from the date of its isolation extensive investigatory work had been carried out. The announcement of the effectiveness of streptomycin upon the TB organism immediately attracted the attention of Dr W H Feldman and Dr H Corin Hinshaw of the Mayo clinic. They were interested in finding antituberculosis agents for testing in experimental animals. 7Waksman, S, “The Conquest of Tuberculosis”, Robert Hale Ltd, 1964Waksman, S, “The Conquest of Tuberculosis”, Robert Hale Ltd, 1964 Dr Wakman agreed to provide the Mayo Clinic with some of the crude preparation of streptomycin. He also arranged for the chemical and pharmaceutical company Merck, to produce a large quantity of streptomycin which would be required for more extensive trials. The first clinical treatments of TB with streptomycin were carried out at the Mayo Clinic in the winter of 1944/45. November 20th 1944 was the day on which streptomycin was first administered to a human being for the treatment of tuberculosis. This was just a few weeks after the first patient had been treated with PAS. The patient was discharged from the sanatorium on July 13th 1947 with a diagnosis of apparently arrested pulmonary tuberculosis. There were however some serious limitations to the use of streptomycin. These included the fact that it needed to be painfully injected, and after long term therapy the development of resistance took place. There was also a particular toxicity of the drug which led to a loss of hearing or the sense of balance in some patients. In 1945 Waksman started to give interviews to the press describing himself as the “discoverer” of streptomycin.9Pringle, Peter, “Experiment Eleven”, Bloomsbury Publishing, 2012 He also described Albert Schatz as “one of his assistants”. Albert Schatz was one of the graduate students who had worked with Waksman. Although he only worked with Waksman for a relatively short time, he had performed most of the laboratory experiments leading to the isolation of streptomycin. He was also the first author on the original publication and his name was on the patent application as one of the inventors. 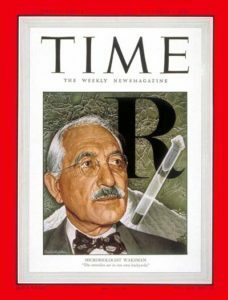 Waksman was to receive numerous honours as a result of his work on streptomycin and in 1949 his portrait was on the cover of Time magazine. In 1949 Schatz decided to write to Waksman about various matters concerning the streptomycin patent, the royalties, and his various dealings with Merck and Rutgers. 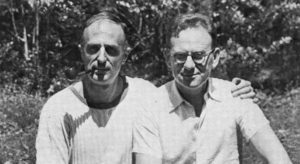 Waksman and Schatz went to court but settled in 1950. Schatz was accorded the legal status of “co-discoverer” and given 3% of the royalties. So which was the first TB drug, PAS or Streptomycin? This depends on how you define being “the first”. Is it when the drug was first isolated, or when it was found to have anti bacterial properties? Is it when the drug is first given to humans or when information is first published about it? In October 1944 PAS was first given to a patient for the treatment of TB. November 24th 1944 is the date that streptomycin was first given to a patient. The rifamycins were discovered in 1957 in Italy when a soil sample from a pine forest on the French Riviera was brought for analysis to the Lepetit Pharmaceuticals research laboratory in Milan, Italy. A research group led by Professor Piero Sensi and Dr Maria Teresa Timbal then discovered a new bacterium. This new species was of considerable scientific interest as it was producing a new class of molecules with antibiotic activity. 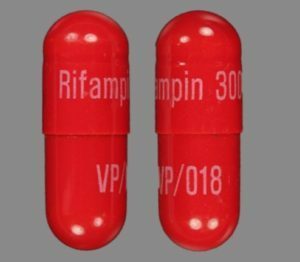 Rifampin was first used clinically in 1966. But after the development of the rifamycins the history of TB drugs effectively came to a halt, with no new TB drugs being developed for the next fifty years. Bedaquiline also became available in 2012. It is also used to treat drug resistant TB when no other treatment is available. There have however been some difficulties with both of these drugs.